The School of Medicine’s Office of Faculty Affairs and Faculty Development is committed to facilitating the success and academic advancement of our faculty. 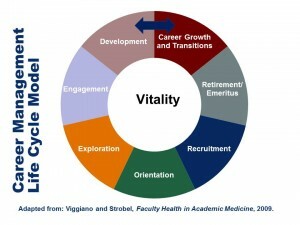 The faculty career life-cycle includes Retirement/Emeritus as the culmination phase. We are available to help in planning for the transition to retirement and welcome your questions and feedback in order to continuously provide helpful information. These pages were created to assist you in navigating the retirement process; whether you are considering retirement in the near future or just interested in learning more about it. For emeritus status upon retirement. Further resources related to retirement.